Visit http://www.nolan.ie to see the new site - while not entirely complete, it's getting there with the aim to have a more mobile focused site. The New Companies Act 2014 will come into effect on 1st June and in advance of this the CRO have announced deadlines for filing incorporations, change of name or re-registrations under the existing Act. In light of this, anyone wishing to incorporate a company through our Company Service website will need to submit their order this week in order to ensure that it will be received by the CRO before the deadline. We will attempt to process orders received after this week but in those cases we cannot guarantee submission before the deadline. Conference about companies act changes for accountants just getting underway at chartered accountants house in Dublin. Speakers include Ms. Maureen O'Sullivan, the current registrar from companies registration office, a representative fron the director of corporate enforcement, Deloitte and chartered secretaries. Check back later for a summary of highlighted issues. Irish charities are facing a whirlwind of change in 2015 with the implementation of the Charities Act 2009, and all small charities are also wondering how the new Companies Act 2014 will affect them. Irish charities tend to be companies limited by guarantee and we've outlined below certain issues to watch for when the new act is implemented in June 2015. The company name must end with ‘Company Limited by Guarantee’ or ‘Cuideachta faoi Theorainn Ráthaíochta’ (which can be abbreviated to CLG/C.L.G. or CTR/C.T.R. ), unless an exemption is obtained from the CRO (existing exemptions will be upheld). Existing CLG with names ending in ‘Limited’ or ‘Teoranta’ will retain these for the transition period, but will have them changed by the CRO afterwards (31st November 2016) to end with ‘Company Limited by Guarantee’ or ‘Cuideachta faoi Theorainn Ráthaíochta’ respectively. A single document Constitution will replace the Memorandum and Articles of Association of the company. However, in the case of existing CLG, the new form of Constitution contains the Memorandum and Articles of Association within it, and it will not be necessary to create a new Constitution so long as the existing Memorandum and Articles of Association does not conflict with any of the provisions of the new act. Dublin Chamber of Commerce are hosting a Conference focused on SME's in Ireland on the 15th of May, 2015 with a number of interesting speakers. The event will be held at the Aviva stadium and target small companies looking to grow, network and build a competitive edge. Further information at Event Bright here and the official Momentum Summit 2015 website here. The New Companies Act 2014 and what you need to know as a director. 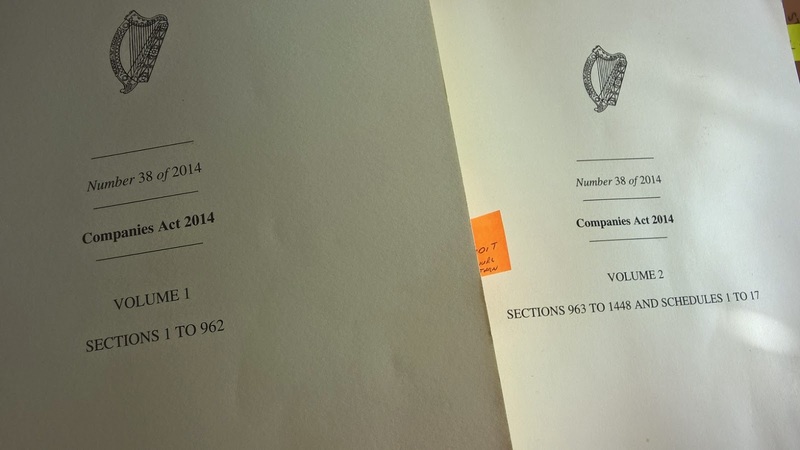 Company law in Ireland is changing. A New act being brought in a transition period from June 2015 – November 2016, will replace the last 52 years of company law in Ireland. For company owners and directors It will be required to "convert" the company to a new format, and replace the original memorandum and articles of association with a constitution. The "new" limited company model allows for one director companies among other changes discussed below. Existing limited companies (EPC) will automatically transition to this model at the end of the transition period, 31st November 2016. Existing limited companies will be treated as this model during the transition period, but will need to apply by 31st August 2016 if they wish to transition to this model permanently. Otherwise they will automatically be converted to the new Limited model at the end of the transition period (31st November 2016). Labels: CLG, Companies Act 2014, Companies Office, DAC, Designated Activity company, One director company. The companies Registration office has released an information leaflet detailing frequently asked questions of the new companies act which is being brought into force on the 1st June 2015. It includes information on changing to new company models e.g. DAC (Designated activity companies) and new LTD company (allowing one director companies for the first time). Labels: Companies Act 2014, Companies Office, CRO, DAC, Designated Activity company, One director company.